It is a popular misconception that only samurai were allowed to wear swords. The truth was a bit different- only samurai were allowed to wear the Daisho. So, what is a daisho? The word daisho is actually two smaller words combined: Dai translates as ‘long’, and sho, which translates as ‘short’. The word daisho thus applies to the set of one long sword and one short sword worn together. Back in the early days of Japanese feudal warfare, warriors used the tachi as a battle sword. This was a blade averaging eighty centimeters in length, and most often used from horseback to slash down infantry. It was formed as is the familiar katana with a slight curve and a chisel-like point. It had a shorter tang, and was made for one-handed use, freeing the other hand to hold the reins and guide the horse. In the girdle, it was worn as are common western swords- with the edge facing the ground. The size of the tachi made it impractical for use on the ground and its one-handed use limited the power one could put into a strike or parry, and thus it found little favor among the infantry samurai and other warriors. Later, a cut-down version of the tachi became popular. This was the uchigatana, which became the katana with which we are so familiar. This blade was of similar build and construction, but was only seventy centimeters long. Its slightly small size is the only difference from the tachi, as well as its position in the girdle. Whereas the tachi was placed with the edge down, the uchigatana and katana were placed with the edge up. This allowed for a new style of fighting. With the tachi, one must first draw the blade, then attack. Two actions. With the uchigatana or katana, one could draw and attack in the same movement- one action. This became refined into Battokiri- the lightning draw-and-slash, though it was never very popular. Other aspects of the katana furthered its popularity with the warriors. It was long enough to fight with, yet short enough that is did not hamper its wearer. It also allowed the wearer to freely use bows or polearms such as the naginata. And it could easily be used indoors or in the cramped conditions of a packed battlefield. The uchigatana/katana also had a longer handle, facilitating use with two hands, but was balanced well enough to be wielded in one if needed. It was thus more flexible in use. But not even the shorter katana could provide a warrior with a weapon useful everywhere. Sometimes the battlefield was a hallway, or a tiny gorge, or the katana was knocked from a samurai’s hand. What then? Well, the samurai took to wearing a back-up sword. This was a blade much shorter than a katana, but longer than a dagger. 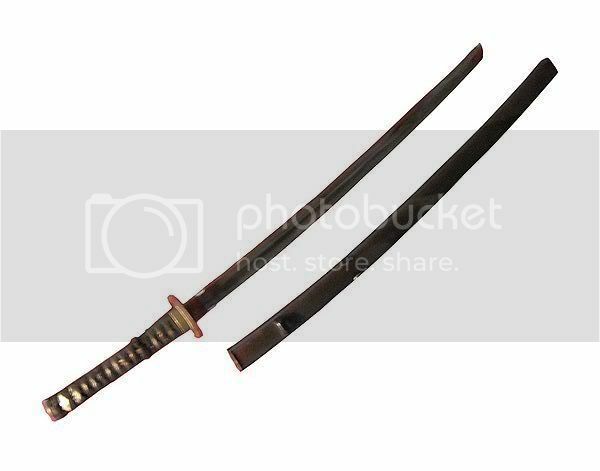 This became the wakizashi, and was used most commonly as a one-handed sword to decapitate fallen enemies (the other hand held the head taut in order to sever it better), or to plunge into one’s own gullet in seppuku to erase shame or failure. The use of ashigaru (peasants) in warfare meant that the populace in general could be armed. In a society such as Japan, where learning and excellence were prized, one could not forbid peasants from studying the art of war, nor forbid their practicing with weapons to improve their abilities. Thus one could also not reserve the wearing or use of the katana, uchigatana, or tachi to only the warrior class, as was done in the west where only knights could wield swords while squires were forbidden the weapon until knighted. In the west, the sword was a symbol of the warrior. In Japan, the sword was a weapon, and available to all who could afford one and study its uses. So, how does one distinguish the warrior caste from a peasant practicing? This is where the Daisho comes in. The combination of long sword and short sword was the mark of a samurai- he studied and used both. No other class did. Thus it was a simple matter of logic, followed later by a decree, that the combination of long and short sword together were the prerogative of the samurai caste and the samurai caste only. Thus the Daisho became the symbol and mark of a samurai. Note, the term Daisho refers to long and short. It does not mean that the long sword must be a katana, or that short one a wakizashi. Any combination of long and short was the daisho. A tachi and a katana made a daisho, and nodachi and a tachi made a daisho, and a wakizashi and a tanto (dagger) made a daisho. It is interesting to note that the combination was the distinction, not the weapon itself. Good stuff Terikel, fitting that one of our first few articles is on the blade. But whilst conducting your research did you find many sources which herald the Daisho as the Samurai's primary weapon? From what I gather it is more a secondary option and status symbol. The Daisho is a status symbol. It is the combination o long and short blades which mark a samurai. The primary weapon of old was the tachi, which was replaced by the handier uchigatana and the katana as primary weapon. In the later ages, polearms began to be the primary weapon used in battle, while the katana was used when the polearm was no longer useful- like when the enemy was too close. The wakizashi, the short sword, was used if the katana was lost, or after the battle to cut off heads. Or, if defeated, to end the misery of the man who owned it. So peasants could have weapons, just not a long and short sword? Peasant could and did have weapons, but were forbidden wearing a long and short one together.